Donovan Vicar is a "feeler"-a man who feels the vibrations of people around him. One October evening on his way home, he bumps into a man that he senses to be particularly evil, and he embarks on a late bus ride to seek him out. As the empty bus leaves the station in foggy Bitternest, Louisiana, Donovan falls asleep. When he wakes up, he is disoriented by what he sees-he is still in Bitternest, only his surroundings seem more primitive and unfamiliar. He is shocked to realize that he has traveled back in time to the year 1957 and that the city is plagued by the mysterious disappearances of numerous young women. Everything points to Timothy Crane, a man alleged to have many shady associations and rumored to be dabbling in black magic. Aided by Ritchie Campbell, a young man with his share of dark secrets, and his old friend Edgar Ward, Donovan finds himself caught up with the events unfurling in Bitternest. He is slowly coming to terms with his gifts as a "feeler" and only begins to get a glimpse of all the power brewing inside him. Alan Draven was born the same year KISS's first album was released. He lives in Montreal, Canada. His stories have been published online, in magazines and anthologies. He is also the founder of Pixie Dust Press. His first novel, Bitternest, was published in 2007. In 2008, he edited the gothic anthology Sinister Landscapes which went on to become a number one Amazon bestseller. In 2009, the novella collection Creeping Shadows was released featuring his novella “Vengeance is Mine”. In 2010, his short story and novella collection titled The Bitternest Chronicles was published. His screenplay for his short story “Breaking and Entering” was adapted into a short film to be released soon. 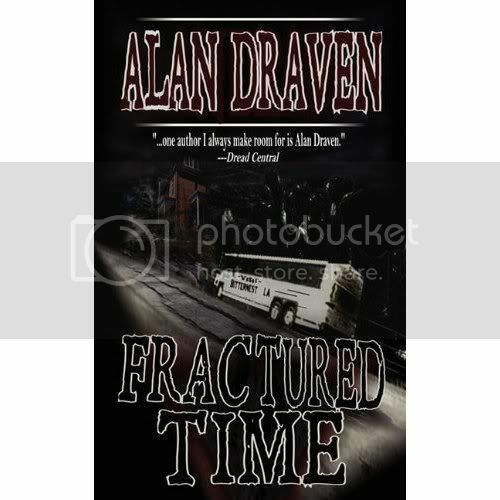 Fractured Time is his second novel. His books can be found everywhere online. This Urban Fantasy/Horror/Dark Suspense is a great book that kept me reading and I didn't want to put it down. It is an easy and quick read and I enjoyed every since page.Totally worth the time I have spent reading this book instead of doing housework. I think if you enjoy urban fantasy/horror and dark suspense you most likely will love this book as much as I did.